Nite Owl Creates: Spring Themed Pinterest Party! 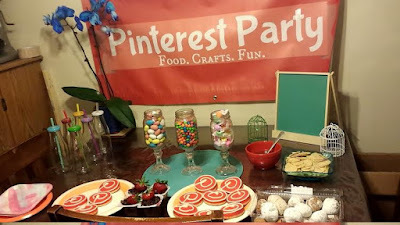 It was time to do another Pinterest party and spring is a fun theme to do so that's what we did! My sister had to cancel coming at the last minute which was really sad. We had 4 girls show up and we had a blast! Getting set up for some of the crafts. I was in charge of the one on the left and my coworker and her daughter brought the one on the right. What did we make? 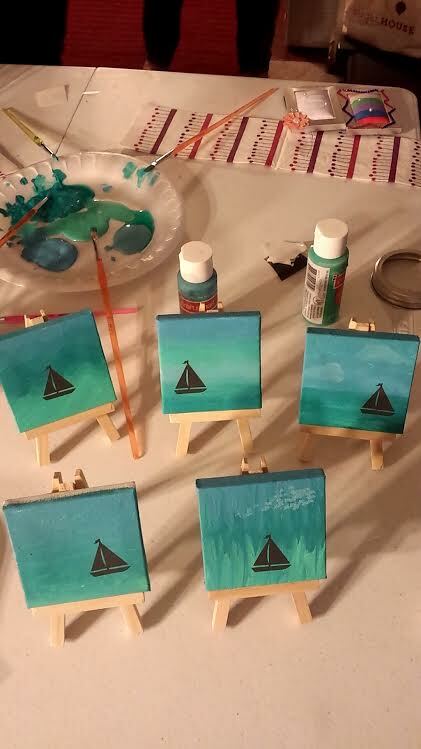 We all painted a tiny canvas! Thanks to Craft Warehouse for the canvas and easels. I've had these since last year, just waiting for the right time and idea to use them. We blended 4 colors of paint, a combo of blues, greens and teals into the ocean. 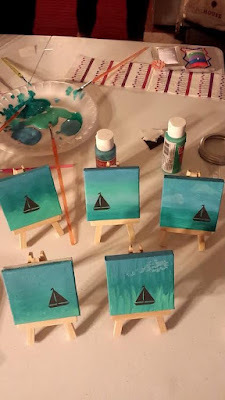 I used my Cricut Explore machine to cut out sailboats in Cricut Design Space. I used dark gray vinyl so people could stick them on the canvas. They turned out so unique and cute! 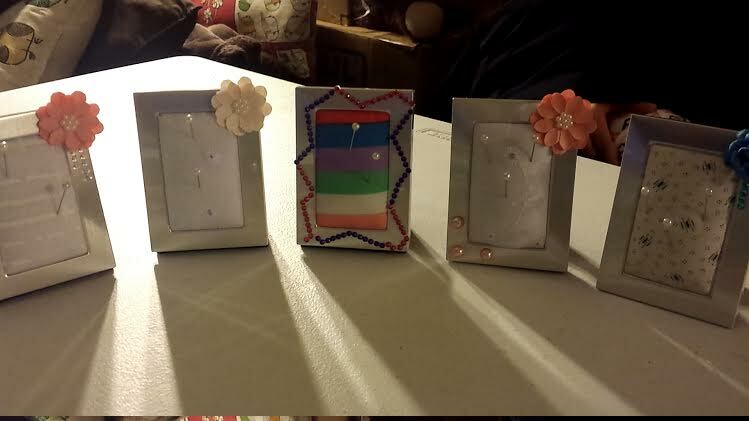 We made ring holders which consisted of small frames, some stuffing and cute fabric to hold it all in. There were embellishments to use to spice up the frames a bit. You can hang your ring on the pin to hold it while you wash dishes or bake. My former neighbor was able to come and brought awesome iron on that we attached to dish towels. There were 3 different designs but only 2 are pictured here. Simple, fun, easy and a useful item to have! 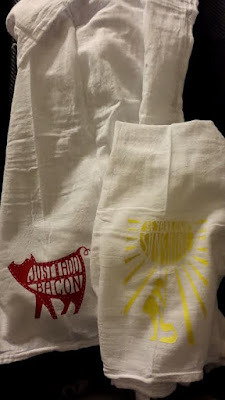 Who doesn't need another dish towel? I ironed these 2 and my sister picked out the yellow one and I kept the pig "just add bacon" one. I was not sure how these were going to turn out but they actually turned out really cute! 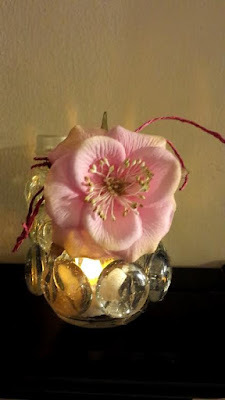 You take a glass jar, various sizes of clear stones and hot glue them on to the glass. 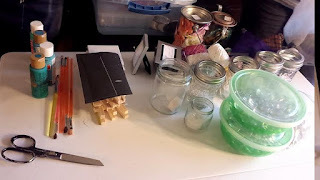 You can cover the jar or just do part of the jar. 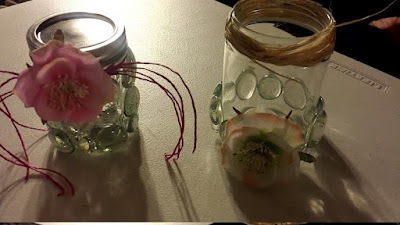 We tied some colored twine to the top of the jar and added a flower as well. Put in a small battery operated tea light and it makes a nice outdoor light for your patio table or a nightlight in your house. Can't forget the food! 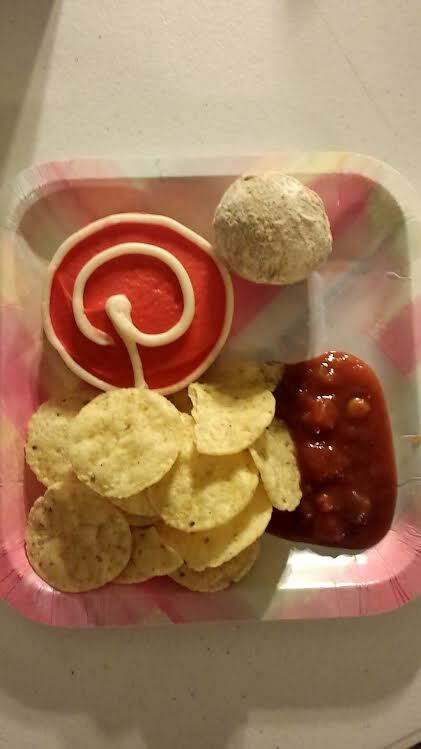 My friend Frieda made these custom Pinterest cookies and they turned out amazing! 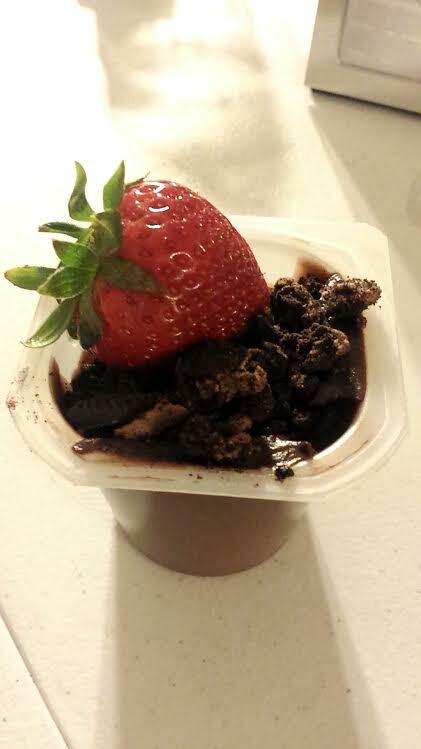 Too perfect to eat! But we had to eat them and they were so soft, melt in your mouth, deliciousness. Maria brought a simple craft-treat to put together and eat. She made them all for us and they turned out very pretty looking! Take a chocolate pudding cup, crumble Oreos on top (these were peanut butter Oreos) and add a strawberry for a yummy snack. I appreciate everyone so much who was able to make it. The next Pinterest party will be a Christmas-in-July theme....unless we decide to do a party in May or June. If you'd ever like to host one, feel free to let me know!